Week 2 - Good bye to the cast! This week I had my plaster cast removed, my moon boot installed and my first appointment with my sports doctor. Congratulations for giving the boot the boot! I have been two shoes for 3 weeks or so and I also am having to manage swelling. I tried a compression bandage for Achilles, but the half of my foot that stuck out from the bandage swelled up like a balloon. I have ordered a compression sock to try - we’ll see how that goes. Please pass on anything you learn about what works and what doesn’t. Yes that is a great point. I started off with really small steps and only FWB for about half of the day. Over a week my leg has gotten a lot stronger! Another tip I learnt last time is to use an exaggerated walking motion (lifting your knees quite high as you step through), this forces a walking motion, rather than limping. I don’t do this all the time, but it’s a good reminder a few times a day! Congrats on FWB! For me the big thing with FWB was to start by taking small steps but with a normal gait. As I got more strength and flexibility in the achilles I could lengthen my stride. Initially I was walking with itty, bitty steps - but with a normal stride The important thing is to resume walking with a normal motion so your leg learns to do it the right way, even if your stride is a lot shorter than before surgery. The stride length will come back as your achilles gets more flexible. 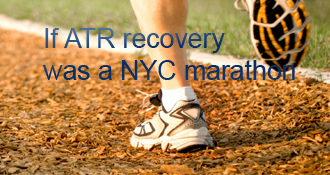 Thanks for the detailed report - you’ve gotten really good at ATR recovery! Thanks Agnes Yes, it really is like I’m living my nightmare lol. No antibiotics and was doing regular yoga and calf raises, along with other training. I have a bit of family history of Achilles issues (Mum has awful tendonitis), so for now its being attributed to genetics and bad luck! I just had my 3 week check up and am healing well This stage goes so slowly though - I’m hanging out for PWB!!! No way! I am so sorry Nicola! What does your doc say about the fact that you ruptured both tendons in such a short period of time? That is the biggest fear for everyone. First worrying about re-rupture and then rupturing the second leg. Did you take any antibiotics in the past that are known to cause tendon ruptures? Have you been exercising and stretching the “healthy” leg? Just curious if it it genetics, or? Vicky - that is awful luck. A third rupture terrifies me! How did that happen? I went on holiday 2 weeks after rupturing my Achilles the first time (I have ruptured mine 3 times). I hired a mobility scooter so I could still join in most of the activities and get around with the crowd we went away with. My recent rupture requires major reconstructive surgery due to the amount of damage. Good luck with the holiday!! Yes, I’d definitely suggest wearing the boot whenever you are out and about - you will still be in the high re-rupture risk period at that point. Just posted about this week! Glad to hear your holiday went well and hope your next ones goes just as well. Unfortunately the flight was already booked before the injury and can’t change the dates. I am taking the boot with me just in case I need it to go places. Hows your recovery coming along? Wow you are keen! I was meant to go to China 7 weeks after my last ATR but I cancelled. At 7 months instead, which was lucky because we did so much walking! You’ll probably need to rely on taxis quite a lot I imagine. Good luck! You wouldn’t believe it but I already have a holiday booked in for October 31st to South America (I am from Australia). When I leave it will be exactly 8 weeks from the date of the injury. To say I am scared is a complete understatement so I’m trying to get as much advice as I am can before I leave. It was 3.5 months before I was walking well (I went on holiday at that stage, but to Australia and we had a rental car). It was a little longer before I was doing long walks (~1 hour). However, I had some trouble learning how to walk last time - I picked up a limp so I had to restart with physio support. I’m hoping to go on holiday to Asia around 3 months this time! It’ll be a little different to what we planned but I’m determined not to cancel! I started walking in the cam-boot without the crutches on the Saturday that just went by so I am pretty happy right now. This page has really helped me and it’s so good that we can share with each other. Do you last time how long it took before you could walk normally? Mattypicks - hang in there, the rehab gets more interesting around that stage as you start to see real progression! Yes, it’s a good point about drinking lots of water. Hopefully the body is flushing out plenty of damaged tissue! I am currently on week 4 after the injury. I’m struggling with this injury for the first time so I admire you for your strength since this is your second rupture. My diet has been very healthy since my injury. I’ve been taking vitamin C tablets as that also contains collagen. Eating a lot of fruits, vegetables, meats and nuts too. Also drinking plenty of water so I hope this all helps the body. Nicolaatr’s AchillesBlog is proudly powered by WordPress and WPDesigner..